Slatan’s Story – Virtual Ability, Inc. Some days living with PTSD (post-traumatic stress disorder) can be really, really difficult, and really, really lonely. This is no doubt also true when one lives with other types of disabilities or illnesses. I am from Italy. I joined Second Life in 2007. I discovered Virtual Ability in 2009, and became a member in 2011. My service as a Grid Mentor, and my love of helping people learn new skills helped me to meet new people. But it was VAI that opened a gate to the world of people with disabilities and invited me in. A special friend from VAI once told me, “We don’t compare each other. We each have different burdens and challenges.” Being part of this community, being welcomed for who I am and what I can contribute, has been profound. Entering into this world of people with disabilities has allowed me to see that disability can be normal. I feel normal in VAI, not different. I feel connected to reality in a way that no therapy has ever achieved. As a part of VAI, I am free to live with my disability without struggling as much. I like to share my knowledge and my skills. I give weekly classes and tours, and work to help simplify Second Life for people with different abilities. I keep my own skills upgraded, too, attending classes, participating in discussions, and going to Virtual Ability’s two annual professional conferences. I enjoy exploring all of Second Life, and I build, sculpt, and do photography. I am an artist with works displayed in many galleries and shows in Second Life. And this matches the many of the things I enjoy in my physical world too: reading, exploring, visiting art exhibitions, creating art, especially photography, and staying tuned in on what is happening in the world. Being a part of Virtual Ability has changed me as a person. I feel part of a community here. I never feel judged. I am not refused or rejected for how I am. Each person here is a mentor to others, sharing different experiences, exchanging ideas, and even supporting each other as we each face our many different issues in life. Virtual Ability is not just another Second Life group. It is like being a member of a family, in a way, a family with all sorts of members connected together despite thousands of miles and tricky time zones. The physical world has so many boundaries. Virtual Ability reaches across those boundaries and creates a sort of magical bubble characterized by care and consideration of every single VAI member. We are like neighbors, relating to each other, never forgetting who we are, supporting each other, and making real a personal growth and awareness that lets us face the daily complexities of life. My PTSD caused me to shut down and pull away from the world around me. I had no family, very few friends, and a strong sense of indifference for people. I was untouchable and distant. I felt I had to be. But this experience here has offered a sort of magical spark that has inspired me and has lit up my dark and cold essence in a really significant way. To be useful, to be needed, to be helping others and learning new things each day gave me the motivation to open myself to unknown people, to socialize, to step toward, instead of away, from relating. I saw that I was considered as a benefit to many, and I felt respected. This freed me to consider and respect myself once again. Yes, my demons, my regrets, my disillusionments, my fears are still part of me. They visit me still from time to time, a reminder that shakes me to my core. But I have learned that my disability is merely one part of me, and that I am not less because of it. 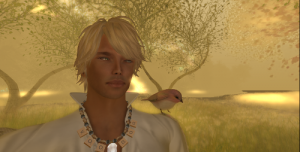 When I am in Second Life, I am free to be eager, curious, contributing, alive. Virtual Ability has taught me how to be who I am in a very important way. In a very real way, Virtual Ability and Second Life have saved my life.